A New York City, il 16 settembre, ha debuttato il primo servizio di "she taxi-she rides", (vedi app disponibile da dicembre), taxi guidati da donne, che trasportano solo donne e ideati da Stella Mateo, madre di due figlie. 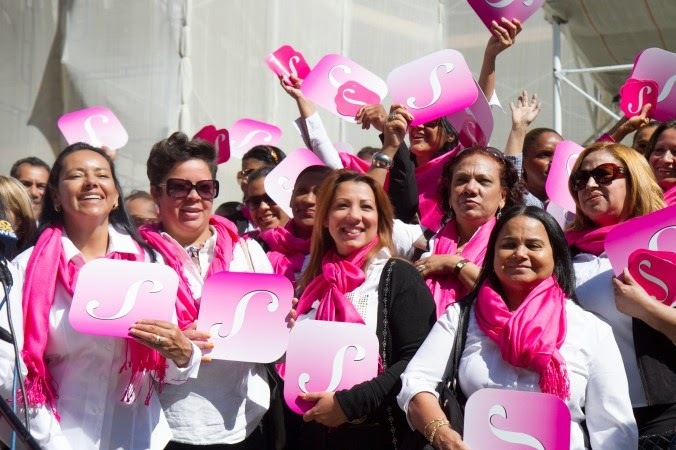 Insomma un progetto totalmente femminile che mira a garantire sicurezza e confort sui suoi taxi "rosa"
In New York City, September 16, debuted the first service of 'she-she taxi rides', (see app available from December), taxis driven by women, who carry only women and designed by Stella Mateo, a mother of two daughters. A short project totally feminine which aims to ensure safety and comfort on her 'pink' taxi. How to recognize them? The taxi drivers are wearing a pink pashmina. At the moment there are 50 taxis. Spopolano anche a Londra (Pink Ladies oppure Ladies Chaffeurs), purtroppo in Italia ancora no...cosa aspettiamo?! A big success in London (Pink Ladies or Ladies Chaffeurs), unfortunately in Italy still no one...what are we waiting ? !